OTTAWA - Health Canada is reminding Canadians to take steps to prevent cross-contamination of foods when shopping with reusable grocery bags and bins. As an environmental choice, many Canadians are now shopping with reusable bins, plastic bags and cloth bags to reduce the amount of plastic they are using. Health Canada supports the proper use of these products, but it is important that Canadians use them safely to prevent cross-contamination of food with bacteria that can cause foodborne illness. Because these bags and plastic bins are reused frequently, they can pick up bacteria from the foods they carry, or from their environment (the ground, the back of your car or the items stored in them between grocery trips). When using cloth bags, make sure to wash them frequently, especially after carrying fresh produce, meat, poultry or fish. Reusable grocery bags may not all be machine washable. 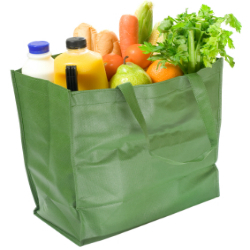 If you are using this type of grocery bag, you should make sure to wash them by hand frequently with hot soapy water. Plastic bins should be washed using hot soapy water on a regular basis as well. It is also important that you dry your grocery bags and bins after washing. Put your fresh or frozen raw meat, poultry and fish in separate bins or bags from fresh produce and other ready-to-eat foods. Putting your fresh or frozen raw meat, poultry or fish in plastic bags (the clear bags found in the produce and some meat sections work well) will help prevent the juices from leaking out and contaminating your reusable containers and other foods. Fresh produce should also always be put in plastic bags to help protect them from contamination. If you are using your grocery bags or bins to store or transport non-food items, they should be thoroughly washed before using them for groceries. It is estimated that there are approximately 11 million cases of food-related illnesses in Canada every year. Many of these illnesses could be prevented by following proper food handling and preparation techniques.